A call for proposals for the 9th edition of HATCH has been put out by the Harbourfront Centre in Toronto. HATCH is a development program for local performance artists and companies. Successful applicants receive a residency and mentorship from Harbourfront Centre. For this series, the curator will be Jess Dobkin who has received international recognition for her work. She has been named Best Performance Artist by NOW and X-tra. The deadline for applications is June 20th, 2011. 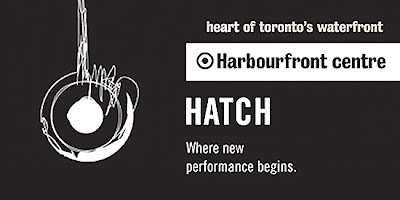 Harbourfront Centre is currently seeking proposals from Toronto-area artists and companies working in the field of performance for HATCH for the 2012 series, curated by Jess Dobkin. Now heading into its ninth year, HATCH is designed to incubate and foster invention and innovation in the local performance scene. The programme has quickly become an important element in the ecology of local performance development. Harbourfront Centre invites projects from emerging creators as well as established artists engaging in new collaborations or entering into new artistic territory. We encourage performance proposals from artists working across all disciplines, including, but not limited to, dance, theatre, performance art, music, etc. Of particular interest are proposals that can demonstrate how HATCH will benefit the project or the artist during this stage of development. HATCH is not about an opportunity for staging a fully finished piece but about using the week to develop a new or existing piece of work. The week itself is about exploring the process of development, with the showing of work being only part of this process. Harbourfront Centre is an innovative non profit cultural organization which creates events and activities of excellence that enliven, educate and entertain a diverse public. Since its inception thirtyfive years ago, Harbourfront Centre has been introducing Toronto audiences to artists and art forms, exploring new and bold frontiers in the arts and creative expression. Jess Dobkin’s performances, artist’s talks and workshops are presented internationally at museums, galleries, theatres, universities and in public spaces. Her creative endeavors have received wide support and recognition, including awards from the Canada Council for the Arts, the Ontario Arts Council, and Toronto Arts Council, and repeated funding from the Franklin Furnace Fund for Performance Art and the Astraea Foundation. She was named “Best Performance Artist” by NOW Toronto and X-tra Magazine, and her Lactation Station Breast Milk Bar performance continues to draw international media attention and interest. Companies and artists selected to participate in HATCH will receive a one-week residency in the Studio Theatre, located at Harbourfront Centre. The Studio Theatre is an intimate, 196-seat proscenium venue featuring a full lighting grid, raked seating and sprung stage floor. Use of the residency period is at the discretion of the artist and needs of the project (i.e. workshop, rehearsals, performance, etc.) but there must be at least one presentation of the work for the public and/or invited audience at some point in the week. • Inclusion in marketing and media relations campaigns, including: media relations assistance and distribution; inclusion in Harbourfront Centre collective advertising campaign; presence in all of our relevant marketing materials; and a dedicated marketing plan developed in partnership with Harbourfront Centre marketing staff. · Artists committed to the development of contemporary, inventive and creative performance-based work. A list of project collaborators, sponsors and/or project supporters. Include letters of reference if appropriate. CVs, bios or profiles of participating artists and key personnel. A script or working document, if available and/or appropriate. Video documentation of your current or past work (VHS or DVD formats), as appropriate. Press clippings, photos, programmes, print materials, press kits or folders if available and/or appropriate. Please indicate on the application form whether or not you wish your support materials to be returned. If yes, a self-addressed stamped envelope must be included. The full application package is available online at http://www.harbourfrontcentre.com/whoweare/submissions/hatch.cfm. For more information, or to receive an application package via email or post, call 416-952-7969 or email hatch@harbourfrontcentre.com. We are unable to accept applications sent by fax or email. “At the very least, HATCH was a wonderful opportunity to work with a premier institution filled with amazing staff & visionaries who provided us the creative guidance and technical support we needed to elevate our process and, ultimately, work. Given our members' geographical distances, we wouldn't have achieved such scale & scope otherwise. "The deceptively simple notion of being able to actually create and rehearse new work IN the theatre the work was to be performed in – with every effort made by Harbourfront Centre staff to provide all the support and resources they could – was nothing short of a revolution for our project and our company. Through our HATCH residency we discovered an immediate, active way of working that I hope will inform our creation and rehearsal methods for years to come." "There are few opportunities in this city that give emerging artists and performers a chance to get together with their collaborators and just create. The fact that this happens in a fully equipped theatre with expert staff able to assist with everything from press releases to technical questions makes it an amazing opportunity for any company. Even just being associated with the Harbourfront Centre has opened up doors for our company."